The house has wonderful Sea & Mountain views. 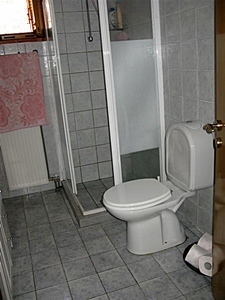 The House has a separate apothiki /studio with toilet, shower, and plumbing. The house is to be sold fully furnished. 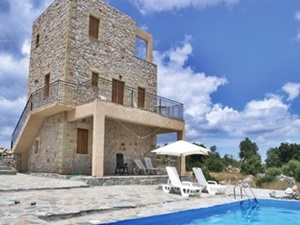 This charming stone house is close to Kardamyli, with impressive views of the sea and Taygetos as well as a well-planned multi-level dream garden. In the garden grow apricots, peaches, nectarines and plums. You will also find good avocados, grapefruit, mandarin and orange trees. 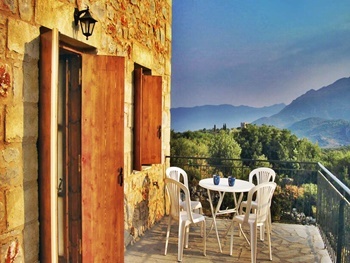 The patios are protected by beautiful vineyards with tasty grapes: a paradise for those who like self-catering! This 90 square metre Stone House is located in a quiet and secluded location within walking distance of the local village and only 5 to 10 minutes to other villages with their full range of amenities. 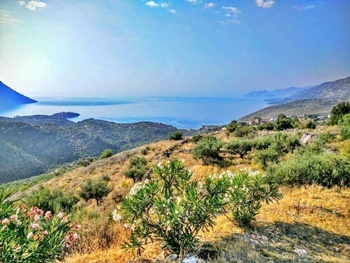 The house is in an elevated position overlooking the local villages with fantastic views of the sea and the bay of Kalamata and the Tayegtos mountains. The house is built on 3 levels and on the lower level there are 2 double bedrooms with wardrobes, shower room with toilet and an area for storage and washing machine space. Marble steps take you to the the middle level with a kitchen with fitted units, a dining are and a lounge. The lounge is large enough for a sofa bed if required for a further 2 people. There is Air conditioning with either cold or hot air. There is a wood burning stove in the lounge area for the cooler months of the year. Double doors take you out onto the balcony overlooking the swimming pool and the stunning views. The upper level consists of a double bedroom with shower room and toilet. Double doors lead out to a large terrace with panoramic views of the whole area. 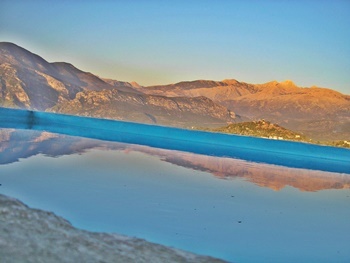 The infinity swimming pool was completely refurbished in 2018. The house is within an easy drive/walk to the local villages Dohli, Stavropigio or Kambos and the picturesque fishing villages and beaches of Kitries are only 10 minutes away with Kardamyli 15 minutes and the main town of Kalamata just 25 minutes away. The house due to its special location has provided an income through rentals on average of over 70 days per year during the summer months. This 90 m² detached stone bungalow built in 2004 stands in its own grounds on a 450 m² plot within easy distance to the popular coastal resort of Stoupa. The garden and wrap round terrace area are mostly laid with flagstone for ease of maintenance although there are few flowering shrubs and an olive tree on the plot. The house was built by a reputable builder from the area and has lovely views down to the coastline at Agios Nikolaos with the mountains and olive groves to the rear. The property consists of a light and spacious open plan lounge with wooden beamed ceilings and a fitted kitchen with wooden storage cupboards and ample work surfaces. There is a gas hob and an electric oven and a full size fridge and freezer. There is a wood burning open fire place in the lounge and tiled floors throughout. A hallway leads to the two double bedrooms both with fitted wardrobes and air conditioning units. The master bedroom has French windows that lead out onto the balcony. 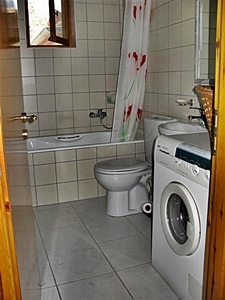 Also off the hallway is a bathroom with bath, shower toilet and fitted washing machine. Doors from the lounge lead out onto the sunny veranda which its roof top awning. Steps lead down into the garden and enclosed car parking space. The property has the advantage of gas central heating, air conditioning units, double glazed windows and wooden shutters. There is a separate storage area of 8 m² on the ground floor. There is also a solar panel for heating the water in summer and a satellite television dish. 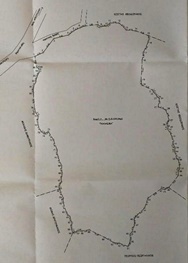 Internet access is also easily available in this area. The property comes furnished and ready to move into and could be used a holiday home or for all year round living. This lovely 64 m² bungalow is situated in an elevated position, on the outskirts of an agricultural village giving it amazing views to the Kardamyli coastline and the mountains the property sits on a plots of 350 m². The property consist of an open plan lounge which is light and airy which has a wood burning stove ,a kitchen with fitted wooden , two bedrooms with fitted wardrobes and two shower room. The property has aluminium windows with mosquito nets air conditioning units and a spare water tank. 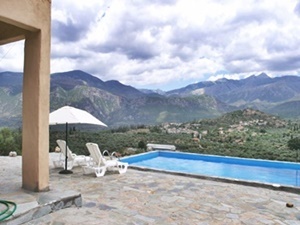 The property offers tranquil living, nestling in a small village above Exochori yet only 20 minutes drive to the picturesque village of Kardamyli and 20 minutes drive to the sandy beaches at Stoupa. A wooden door from the street leads into the lounge/ dining area of the property, it has an open fireplace and a kitchenette with a fridge, small cooker and washing machine. On this level is also a shower room with washbasin and toilet. Custom build wooden stairs take you to the upper level of the property where there is a small guest bedroom leading off the main double bedroom that has timber rafters and French doors that lead out onto one of the two terraces. 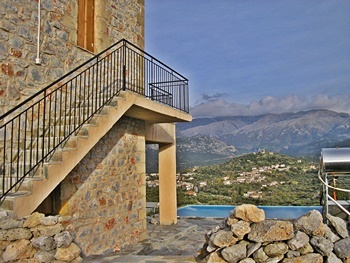 A wrought iron staircase leads up to the larger second roof terrace with spectacular views of the coastline below and the mountains to the rear. The village has 2 excellent Greek tavernas and a Kafenion. This property would suit either as a permanent resident or a holiday home. The property comes with the benefits of all the furniture, fixings and fittings. 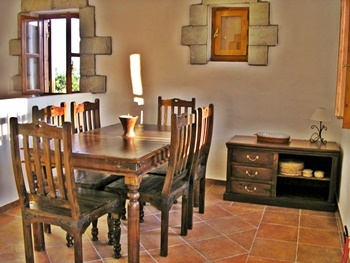 A traditional renovated village stone house located in one of the Mani’s most popular agricultural villages. 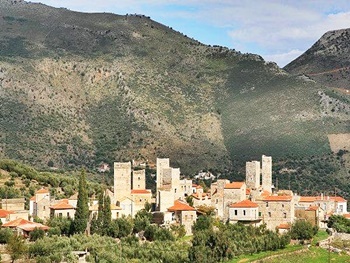 The village host a mini -market and 3 tavernas. The property has been beautifully renovated by the present owners. It is located in the centre of the village with parking close by. To enter the property you go down a small alleyway to the Iron Gate which takes you onto the large walled courtyard with a barbecue terrace. Steps lead up to the rear garden which is planted with orange, lemon, other fruit trees and a large grape vine. There are steps from the courtyard that lead up to the terrace seating area and into the house. 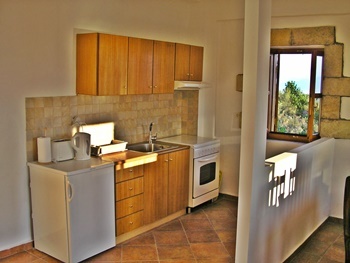 There is a large kitchen, dining area with fully fitted wooden units, cooker, hob and fridge. From the kitchen you enter the large airy lounge with steps down to the 2 bedrooms and the bathroom. 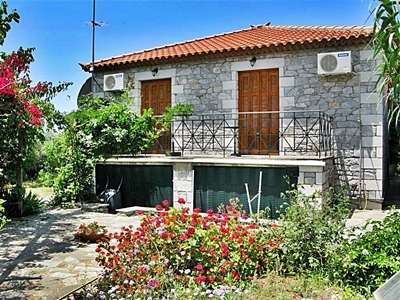 The property has the advantage of being in the centre of a Greek village with a good European community and is only 5km to the coastal resort of Kardamily and 2km to the sea at Kalamitsi. 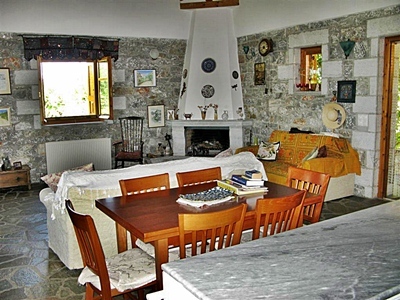 A splendid distinctive stone house of 150 m² located in the the much sort after picturesque coastal resort of Kardamyli. 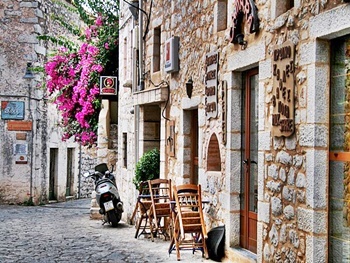 The house is in the beautiful old town of Kardamyli. The inside of the property requires renovation but could be restored to give a stunning 3 bed-roomed residence. There is parking in a quiet street. They are located 600 meters from the main road of, and one kilometer (6-7 minute walk) from the main beach of Stoupa and the central market. All Three of the four buildings consist of two independent floors, with common external input and separate internal entrance for each apartment. Ground floor consists of a bedroom with wardrobe, a living room combined with the kitchen, a bathroom and two spacious stone balconies. Beneath the balconies there are big external warehouses. 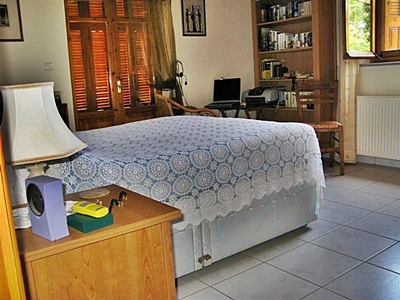 The ground floor comes with an A/C and an LCD TV installed, and all rooms are fully furnished. The kitchen is equipped with all necessary appliances. First floor consists of a bedroom with wardrobe, a living room, a kitchen, a bathroom and two balconies overlooking the beautiful garden and the sea. The 1st floor features an Air Condition and an LCD TV and all rooms are furnished. The kitchen is fully equipped with all necessary appliances. On the ground floor there are two bedrooms and a bathroom. On the first floor there is an open plan kitchen with dining-living area and open fireplace and a W.C. 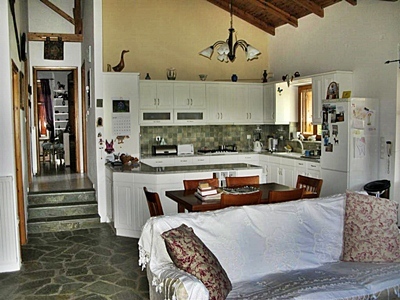 There is a wooden maisonene above the kitchen, and there is central heating as well as air conditioning. Built on a 1,100 square metre plot the house has an area of 165 square metres. There is a garage on the ground floor and a storage room and a one bedroom apartment with open fireplace. On the first floor there is an open plan kitchen, and a living and dining area and a W.C. 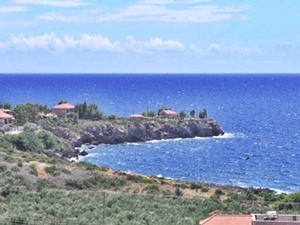 This large 150 m² stone house is located on a plot of 1,200 m² situated in the village of Prosillio ,which is only 10 minute drive to the picturesque coastal resort of Kardamyli. 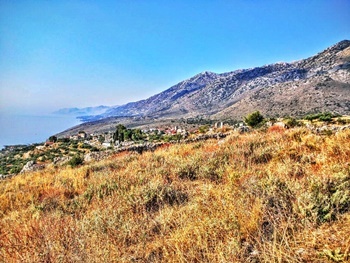 The property is inside the village and has stunning views of the mountains and the Kardamyli coastline. Entering the property through large a metal gates onto the driveway which has parking for at least 2 cars. Stone stairs will lead you into the guest house, which is the original house and the past owners build the larger stone house at the rear of the plot. The guest house has a lounge , a kitchen, 1 bedroom and a shower room. a balcony that offers wonderful views of the sea and the mountains. The house has a swimming pool and central heating. This property would suit someone who would like to stay in the Mani full time with ample room to host family and friends or a large holiday home that could sleep family and friends. 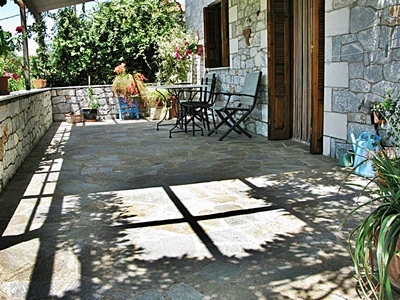 Situated inside Stoupa in a very quiet location, just a two minute walk to the seafront. A big variety is available from 1 to 5 bedrooms and with balconies and gardens. This bungalow is a large 100 square metre house set in a 1500 square metre plot. There is plenty of room to build a swimming pool and it comes with 2 bedrooms, two bathrooms, one with bath and one with shower. It is fully equipped with a modern kitchen, an open fireplace in the living room and has central heating and air conditioning. 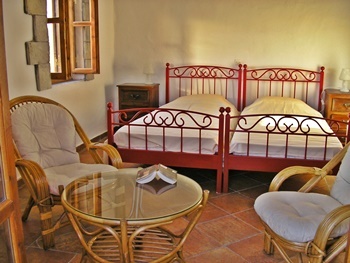 The bungalow is surrounded by a big garden with olive trees and lots of fruit trees. It also has a covered carport. A large 200 square metre stone villa built on a 400 square metre plot with mature gardens. 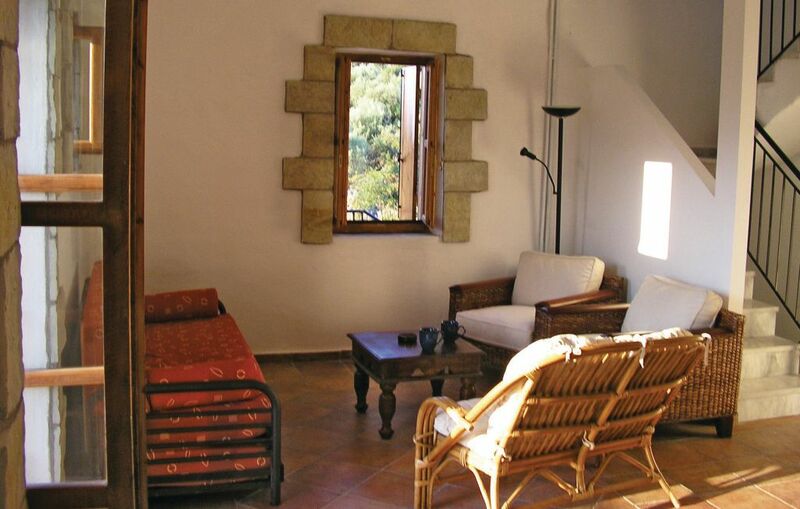 The villa is constructed in three floors with a 70 square metre basement divided in to two rooms. The ground floor is elevated with two large bedrooms, one with en - suite shower room, one bathroom and a covered veranda. The first floor has an open plan kitchen with dining area with open fire place and a covered veranda with sea views. There is central under floor heating, air conditioning, ceiling fans and a back up water system. 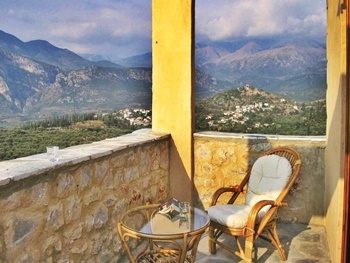 There are 2 large balconies with views of the sea and the mountains. The house consists of a large open plan lounge with a fully fitted kitchen, 2 bedrooms, a bathroom . On the ground floor, there is a self-contained studio apartment. with doors that lead out to the paved garden area where there is a plunge pool. The house has oil fired central heating, double glazed windows with aluminium shutters and a solar system for hot water. This property is ideal for someone who wants an easy drive to the beaches but with and other properties close by. One of the rooms is used as an Artist’s workshop which still houses the silk screen printing machine. The main door leads into the lounge which has a cool stone floor, and a built in fireplace. A door leads into the modern fitted kitchen which has marble worktops, cooker, hob, washing machine and fridge. There is also a dining table which seats 6 people. Off the kitchen is small room which could be used as storage or office space with wooden floors and tiled walls. One door from the kitchen leads out into the beautiful flagstone, vine covered courtyard which is ideal for al fresco dining. A side door from the kitchen leads out onto an exterior storage area used for wood and garden equipment. A door from the courtyard leads into the spacious Art Studio which houses the silk screen printing machine. This is a light and airy room with windows on three sides. A wooden staircase from the lounge leads onto the first floor of the house which has wooden floorboards and which consists of 3 double bedrooms, one with an en-suite marble shower room and French doors that lead out onto the balcony with views over the olive grove to the sea. 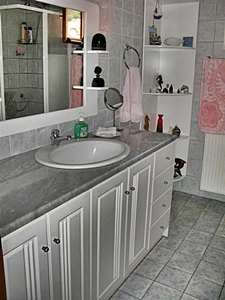 There is also a separate family shower room with toilet and a marble floor. The house has central heating fired by the wood burner via a back boiler. The house has two wells for back up water and a traditional bread oven in the garden. The plot is 8,909 m2. (approx. 2.25 acres) and comprises of a garden set over several terraces laid to fruit trees and flowering shrubs. 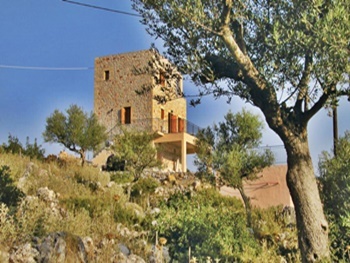 There are 300 Kalianaka olive trees which produce the distinctive Mani oil which is renowned throughout the region. This house would suit someone looking for a detached house in a quiet village with a large plot of land and spectacular views but yet only a 20 drive to the picturesque village of Kardamyli with its shingle beach and clear blue sea, sophisticated shops and local amenities which include a chemist, bank, doctor, post office and grocery stores. This is a unique property waiting for the right owners and really does need to be seen to be fully appreciated. This beautifully renovated village house is 98.38 m² on a plot of 80 m² . The ground floor consists of a spacious bedroom with original wooden beams and craftsman wardrobes. It has two windows making it light and airy one of which is a brand-new tilting double glazed window with insect screen. The hallway which is large enough for a single bed and cupboards. A bathroom with bath and shower attachment / washing machine / wash hand basin and toilet, shelving unit and several power points. There is a large courtyard with utility space and a wonderful shady eating out area with pots and trellis. Internal wooden staircase leads up to the upper level to the open plan living room which is light and airy with 5 windows and good views to the front and rear. The kitchen /diner has fitted units and a traditional original chimney and fireplace and leads onto a terrace area with a pergola, and amazing panoramic sea views. Fantastic for a-fresco dining. Benefits include solar and electric back up hot water system. Aircon invertors which both heat, cool and dehumidify. A spare water tank for emergencies. Stunning panoramic views. Set in a quiet corner of the village. 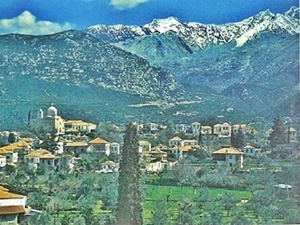 Only 25kms to the city of Kalamata. This well constructed and tastefully designed 90 m² modern house is within easy walking distance to the village of Prosillio. The house stands on its own plot of 1,800 m². The house comprises open plan lounge and fully fitted wooden kitchen area there are also balconies and a guest toilet on this level . The upper floor has 2 double bedrooms and a bathroom . The house has covered terraces, balconies and a stoned seating area to the side of the house , giving one a choice of sun or shade at any given time of the day. The house has a large covered workshop/storage area to the rear It has wonderful views of the Kardamyli coastline and the mountain. 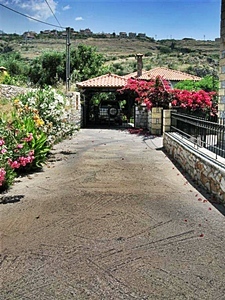 The property is only 10 minute drive to the picturesque coastal resort of Kardamyli with its many shops and tavern’s. The property would suit someone looking for a permanent home or a holiday residence. BACK TO HOME PAGE FORWARD TO PAGE 2. E MAIL BRIAN.